Join the Guardians of the Wild Scavenger Hunt at the Calgary Zoo! Are you ready to share our conservation actions and pledge to take action in your daily life? Are you ready to be a GUARDIAN OF THE WILD? Introducing Guardians of the Wild, the Calgary Zoo’s new on-park program designed to share their conservation action stations and encourage you to take action to protect wildlife and wild places. 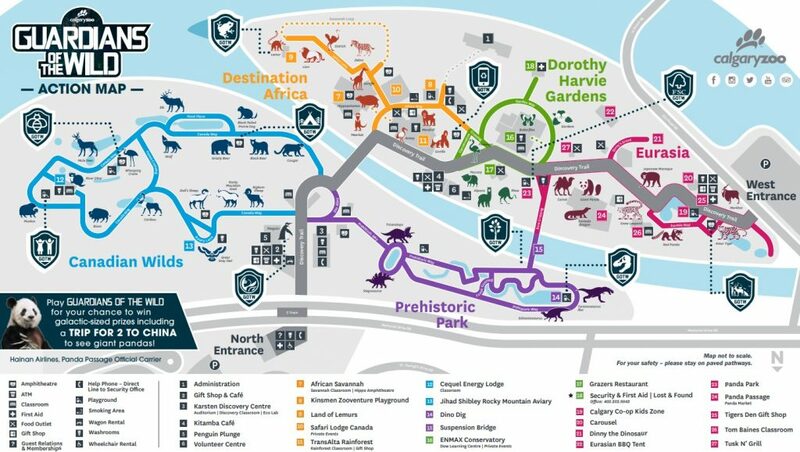 This interactive program will help to enhance your zoo experience and inspire a visit to all corners of the park. Once you have collected all 10 codes, or as many as you can, head over to the website and enter them for a chance to win galactic-size prizes including a trip for 2 to China to see giant pandas. When you are visiting and if you have more questions, stop by the Calgary Zoo’s Plan Your Visit booth near the main north entrance or check the website! The program runs from July 4 – September 3 and the winners will be contacted by September 4. A full list of the rules and regulations is listed on the website. The more stations you visit the more chances you have to win fabulous prizes, including a trip to China! Pollinator Yard Kit: Includes seed package, native plant nursery gift certificate, container pollinator garden, package of local honey, non-toxic lawn care package, permaculture garden tour. Food and Fun Basket: Chocolate gift basket from a Rainforest Alliance certified partner, Cococo by Bernard Callebaut, Coffee from Kicking Horse, lemur puppet. Refurbished Macbook Air sourced from GEEP. Oceanwise Culinary Delight Package: Gift certificate(s) to experience local restaurants and food vendors that feature Oceanwise products. Trip for 4 to the Burgess Shale in Field, BC including accommodations in Field, BC and guided hike. Gift certificates for Forest school registration and MEC. Camping gear package, oTENTik stay in Banff. Columbia River Paddle trip for 4, plus accommodations in Radium, BC, and a rain barrel. 4 tickets to Panda Breakfast. One grand prize trip for two to China. Includes $4500 credit with a Tour Operator to cover flights, hotels, and a visit to Panda Base at Chengdu. Also includes $500 spending money. Click on the map below to get started! This entry was posted in Uncategorized on July 10, 2018 by Calgary's Child. Stop Stampede Frowns Before They Start! Do a little planning before you head out. Decide what makes sense for your family and let your kids know the plan from the start; involve them in the planning if you can. One corn dog, the works or somewhere in between? Decide now so that your kids don’t have to beg and you don’t have to argue. What’s your spending limit? Are you paying for everything or will the kids need to use their allowance for games and souvenirs?This will make yes and no much easier in the heat of the moment. How many are allowed? Which ones are off limits? Who is paying for them? How long are you willing to stand in line for that roller coaster anyway? Let the kids know the time you are leaving, give them a warning and then stick to what you say. If you know that you will cave when your kids beg to stay, just decide to stay without setting the limit – match your words and your actions. If you know that your kids will melt down at a certain time, GO HOME before then, please. Ask your kids what they would do if they got lost. Don’t just tell them what to do, be sure that they can tell you. They need to know (or have with them) your contact info. If you are worried about your kids being at Stampede on their own, go together and set short times for them to go off and meet back at a prearranged place and time. This will help them to learn responsibility and you to determine whether they are ready for more freedom next year. This entry was posted in Uncategorized on July 6, 2018 by Calgary's Child.